Customers walk into a Blockbuster Video store on November 19, 2002 in the Little Havana section of Miami, Florida. 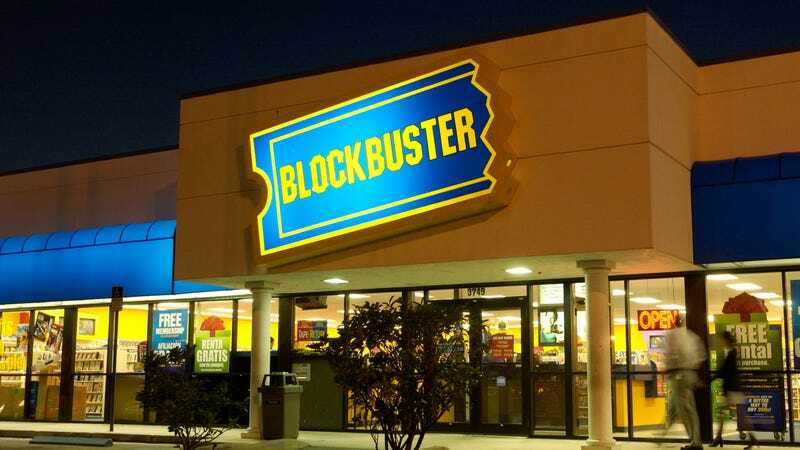 The last two Blockbuster stores in Alaska are shutting their doors for good next week according to the Anchorage Daily News, which means there is just one remaining relic of the video rental giant still up and operating in the entire United States. The final Blockbuster storefront standing is located in Bend, Oregon. It outlasted two stores in Alaska—one in the city of Anchorage and one in Fairbanks—that will officially close up shop on Monday, July 16th despite John Oliver’s attempts to keep them alive by sending the stores memorabilia from Russell Crowe movies. When the last two stores in Alaska officially lock up next week, it will mark the end of a quirky final act for the forgotten video rental chain. Though parent company Dish Network started shuttering storefronts around the US in 2013, Blockbuster managed to maintain a stronghold in Alaska, driven primarily by long winters and pricy, occasionally unreliable internet connections, per the Washington Post. According to data from HighSpeedInternet.com, Alaska is third-to-last in internet connectivity in the US, and just 62 percent of its population has access to what would be considered broadband speed connections of 25Mbps. Anchorage Daily News reported that 13 Blockbuster stores were operating in 2013, and nine were still open in 2016—far from the company’s peak of 9,000, but it’s something. The stores in Anchorage and Fairbanks were the final holdouts, and the owners told Deadline the stores were still profitable, but their closure was all be inevitable eventually. John Oliver highlighted the stores on Last Week Tonight earlier this year when he bought up a bunch of movie artifacts that Russell Crowe ditched in a post-divorce auction, including a leather jockstrap from the film Cinderella Man and sent it to the Alaska Blockbuster stores. Somehow, it seems that wasn’t enough to save them. These are the last two Blockbuster stores in Alaska that survived and it is sad to say goodbye to our dedicated customers. We have thought of you as family for the past 28 years. Both Kelli Vey and I (Kevin Daymude) have been with the company since 1991 and have had great memories throughout our career. Thank you for sticking by us throughout all these years. I can’t tell you how much it means to us. We hope to see you at our stores during the closing, even if it’s just to say “Hello”. What a great time to build your media library and share some Blockbuster memories with us. We will miss all of you! While the Blockbuster locations will shut down on Monday, they will be open through August as the stores sell off their remaining inventory. No word on whether Russell Crowe’s jockstrap will be included in the going out of business sale. If you still have an overdue movie rental you’ve been waiting to return, it looks like Oregon is your last hope. Blockbuster In Memoriam: What&apos;s your favorite video store memory?